A man who slit his partner's throat on her birthday has been found guilty of murder. 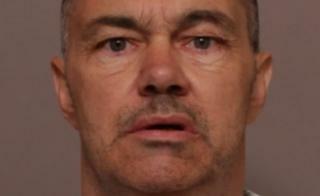 Jeremy Clarke killed Tracey Evans after a night out celebrating her 52nd birthday, police said. The couple had been at a pub in Measham, Leicestershire, on 5 August but left separately to return to their flat in the town's High Street. Clarke, who murdered Ms Evans within 10 minutes of her arriving home, was found guilty at Leicester Crown Court. Leicestershire Police said the 55-year-old called his daughter to confess, and planned to end his own life to save himself from prison. Officers were called to the flat, where Ms Evans was found with a 24cm (9.4 inches) knife wound across her neck. When arrested, police said Clarke confessed to the killing, but later claimed to have suffered from a hypoglycaemic attack and had no recollection of committing the crime. Jodie Winterson, Ms Evans' daughter, said her mother suffered "physical, mental, financial and emotional abuse" at the hands of Clarke. Image caption Tracey Evans was killed by Jeremy Clarke who submitted her to "physical, mental, financial and emotional abuse"
In a statement, she said: "[My mum] will always be remembered for her beautiful smile, her kindness and her complete selflessness. "She truly did have a heart of gold, always putting others before herself and was such a hard-working lady. "Jeremy's actions will never be justified. His total lack of remorse for any of his actions are those only of a controlling bully and a cold, callous murderer." Det Ch Insp David Swift-Rollinson said: "Despite being seen with Tracey's blood on him and confessing to two people he had killed [her], Clarke pleaded with one of them not to call police. "He told others, including the police, he had tried to take his own life to spare himself having to spend many years in prison." Clarke will be sentenced on Tuesday.